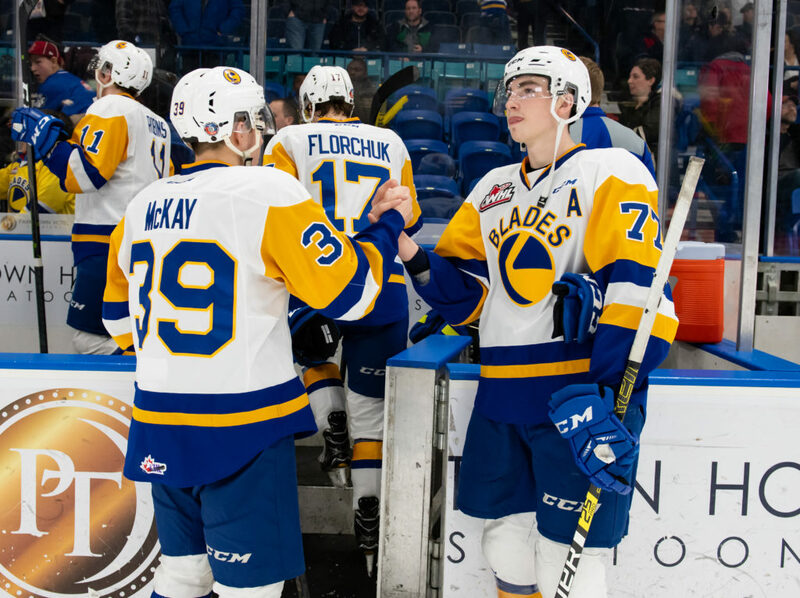 The Saskatoon Blades won their fifth straight game on Tuesday night, securing home ice in the first round of the playoffs thanks to a 4-2 win over the Moose Jaw Warriors. Saskatoon improves to 42-14-8-0 on the year with four games remaining on the regular season calendar. The Blades continued to display their resilience and depth on Tuesday night, finding different ways to beat teams and getting contributions from all over the lineup. Moose Jaw struck first through their leading scorer Tristin Langan (48) just 56 seconds into the game. However, the Blades found momentum after killing off a minor penalty by Nolan Kneen. Randen Schmidt and Cyle McNabb won a battle along the boards just inside the Moose Jaw blue line, and worked the puck free for their centre, Tristen Robins. Robins then straddled the line and dished off to Brandon Schuldhaus on the left point, and the former Warrior snapped his 6th of the season past Brodan Salmond to tie the game at 1-1. Schuldhaus (7) gave the Blades their first lead in the second period; Kirby Dach and Nolan Kneen added the assists. It was Schuldhaus’ first 2-goal game of the season and third of his career. Finally at the 11:29 mark of the middle frame, the Blades were awarded their first power play of the game. Unfortunately Moose Jaw’s Justin Almeida (27) scored just 26 seconds into that man advantage to tie the game 2-2. Saskatoon was quick to respond as Dawson Davidson (11) blasted a one-timer just 20 seconds later; his 11th of the season from Kyle Crnkovic and Max Gerlach. Moose Jaw pushed for the equalizer in the third period but were unable to get anything by Nolan Maier who stopped all 9 shots faced in the final 20 minutes. In fact, the Blades effort in the final couple minutes kept the Warriors trapped in their own zone unable to pull their goaltender for an extra attacker. Then as Josh Brook attempted to skate the puck up the ice himself, the Blades forced a turnover and went back the other way Kirby Dach sent a saucer pass through the slot for Eric Florchuk who whacked it out of mid-air. Salmond made the initial save but Dach followed up on the rebound for his 24th of the season to make it 4-2 Saskatoon. Nolan Maier made 26 saves for his 34th win to improve to 34-10-6-0 on the season. Brodan Salmond also made 26 saves for Moose Jaw. Chase Wouters went 11/21 in face-offs. Kirby Dach recorded his 20th multi-point game of the season. Dawson Davidson‘s goal was his 8th power play goal of the season, tied for 1st among defensemen in the WHL. The Blades head home for their next three games beginning at 7:00pm on Saturday for Don Cherry Night versus the Swift Current Broncos. Sunday afternoon will be a first round playoff matchup preview against the visiting Moose Jaw Warriors at 4:00pm.